Set racks in upper-middle and lower-middle positions. Heat oven to 350 degrees. Line the bottoms of two 13″ x 9″ rimmed baking sheets with parchment paper that you have cut to fit the pans. Spray the edges of the pans and parchment paper with nonstick cooking spray. Pour milk, egg whites, vanilla and almond extracts into 2-cup glass measure, and mix with fork until blended. In a large bowl, stir together cake flour, sugar, baking powder, and salt. Add butter and beat with a hand mixer on low speed until mixture resembles coarse crumbs. Add half of the milk mixture to the flour mixture and beat for about 2 minutes. Scrape down sides with a rubber spatula. Add remaining milk mixture and beat for an additional 30 seconds, just until combined. Divide batter evenly between two prepared pans. Use a rubber spatula to smooth tops. Bake 16 to 20 minutes, or until toothpick inserted in center of cake comes out clean. Let cakes rest in pans for 3 minutes. Loosen from sides of pans with a knife, if necessary, and invert one of the cakes onto a large sheet of heavy duty foil, parchment paper side up. Invert the second cake on top of first layer, parchment paper side up, stacking the cake layers. Allow cakes to cool completely then fold foil over at the edges to secure the cakes and refrigerate until ready to assemble. Can be refrigerated for up to one day. Prepare vanilla pudding according to package directions. Cover and refrigerate until ready to assemble cake. 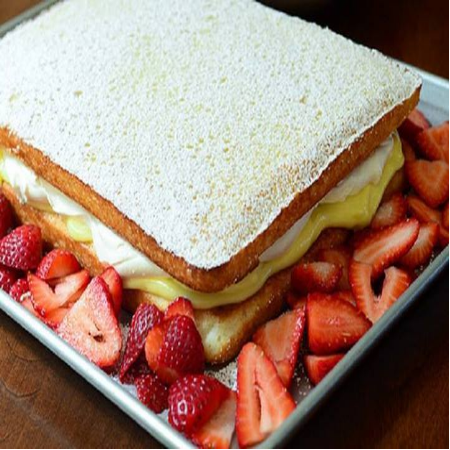 Place one cake layer on a large rimmed baking sheet that is larger than the cake. Spread 1-1/2 cups of the vanilla pudding on the cake layer then top with half of an 8 ounce container of Cool Whip. Place one layer of sliced strawberries on top of the Cool Whip. Top with second cake layer and press down lightly. Scatter remaining sliced strawberries on the pan around the cake for decoration. Dust top of cake with confectioners’ sugar. Serve with additional Cool Whip on the side.